Definition at line 341 of file audioengine.h. Definition at line 1599 of file audioengine.cpp. References LLAssetType::AT_SOUND, gAssetStorage, gAudiop, LLAudioEngine::hasDecodedFile(), LLAssetStorage::hasLocalAsset(), LLUUID::isNull(), mHasDecodedData, mHasLocalData, and TRUE. Definition at line 348 of file audioengine.h. Referenced by LLAudioSource::getCurrentBuffer(), LLAudioSource::setupChannel(), and LLAudioEngine::updateBufferForData(). Definition at line 347 of file audioengine.h. 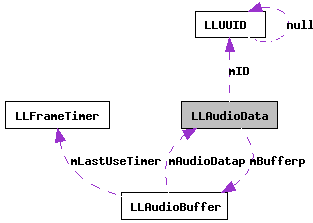 Referenced by LLAudioSource::addAudioData(), LLFloaterEventLog::logObject(), LLViewerObject::setAttachedSound(), and LLAudioEngine::startNextTransfer(). Definition at line 351 of file audioengine.h. Definition at line 350 of file audioengine.h. Referenced by LLAudioEngine::startNextTransfer(), and LLAudioEngine::updateBufferForData(). Definition at line 352 of file audioengine.h. Definition at line 1625 of file audioengine.cpp. References LLAudioEngine::cleanupBuffer(), FALSE, gAudiop, gDirUtilp, LLDir::getExpandedFilename(), LLAudioEngine::getFreeBuffer(), LL_PATH_CACHE, llendl, llinfos, LLAudioBuffer::loadWAV(), LLAudioBuffer::mAudioDatap, mBufferp, mID, NULL, LLUUID::toString(), TRUE, and UUID_STR_LENGTH. Definition at line 355 of file audioengine.h. Referenced by LLAudioEngine::assetCallback(), and LLAudioDecodeMgr::Impl::processQueue(). Definition at line 354 of file audioengine.h. Definition at line 356 of file audioengine.h. Definition at line 358 of file audioengine.h. Definition at line 362 of file audioengine.h. Referenced by getBuffer(), LLAudioEngine::getFreeBuffer(), and load(). Definition at line 364 of file audioengine.h. Referenced by hasDecodedData(), LLAudioData(), and setHasDecodedData(). Definition at line 363 of file audioengine.h. Referenced by hasLocalData(), LLAudioData(), and setHasLocalData(). Definition at line 365 of file audioengine.h. Referenced by hasValidData(), and setHasValidData(). Definition at line 361 of file audioengine.h. Referenced by getID(), and load().